Once and then, I work with couples who’ve either done their homework and hired some of their vendors already, or they consider flying their own photographer or make-up artist, hair stylist, or [insert any person who’ll be working on your wedding day here]. When comes the time to think of design and décor, they find themselves struggling to evaluate the needs without being able to visit the places and visualize the wedding spaces. It certainly is most difficult to organize these services from afar, when you are not physically present in Tahiti, and it’s totally normal to feel overwhelmed or frustated at times! Nelly, thank you very much for all your assistance in the lead up to our wedding. We really enjoyed working with you and really love your personality and approach to helping us get organised. There are for sure things that we wouldn’t have been able to organise without your help. wedOtahiti provided a highly professional, personalized service that greatly exceeded our expectations. Everything was handled at the highest standard and their coordination with the hotel venue for the reception and dinner was flawlessly and exquisitely executed. I would highly recommend this agency to family or friends considering having a wedding in French Polynesia. This is why I have created the wedO(thedesign) package, to help couples (like you!) who are ready to spend that amount of time and energy that it takes to plan a wedding from afar, with just the helping hand you need with the design of your wedding day. 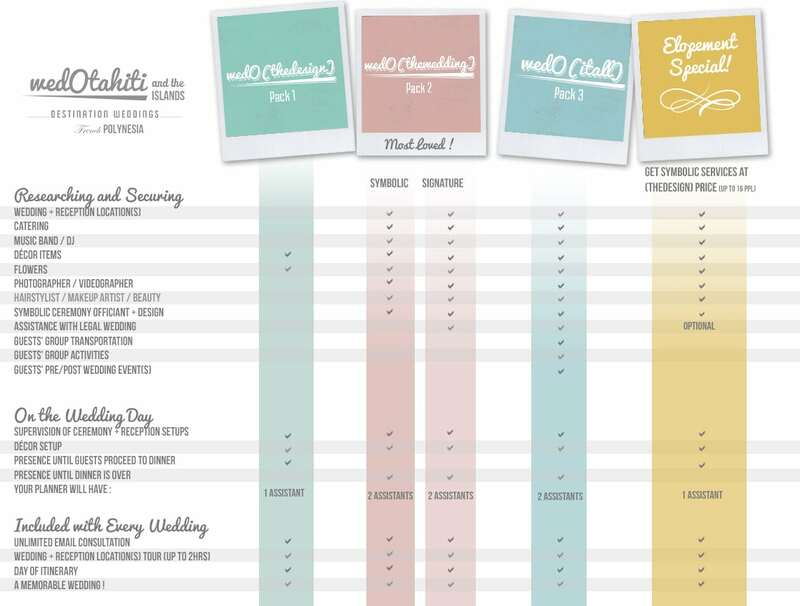 I specialize in full service wedding management, where we work your dream wedding together from start to finish, and you can most benefit from my extensive experience in planning weddings in Moorea (as well as in the outer islands), so I only take a limited number of design only projects, depending on my availabilities. You’ve been organizing your destination wedding in Tahiti for months and everything now seems covered. Congratulations! You’ll be rewarded for this bunch of time you spent with a beautiful wedding. There are only a few weeks left to the wedding day, and here comes finally the time to think of the décor and the flowers. Showing great creativity to make your wedding day your very own and an experience that is true to who you are, is the final important step. You’ll need to find someone who listens to your ideas and bring them to life on the wedding day. Not only will I help you to determine what décor items, colors, sights and flower fragrances will bring a memorable multi-sensory experience to your wedding day, but I will then gather all the information from you about your wedding vendors and come up with a detailed timeline for the day. You’ll pass the planning and coordination onto me so that you can fully enjoy the wedding experience! On the wedding day, we will set up your décor and supervise that all goes right throughout the day (until guests proceed to dinner). I’m super flexible and I can customize !